The “me too” posts were the first thing I saw when I tried to just “say hi to the internet” for a few minutes last night. I ended up reading so many, many friends’ posts, and had trouble getting to sleep. First: Yes, of course, me too. I experienced intimate partner violence, in its myriad forms, over many years during the 1990s. There’ve been many other incidents in addition over the decades; none of the perpetrators have been strangers to me. But listen: Assault and abuse and harassment don’t only happen to women. Our culture is pervaded by trauma. I am more likely to know of the sexualized trauma my female/femme and queer/trans friends have experienced, because we sometimes open up to each other about these experiences. But very nearly every man I’ve been extremely close to has *also* experienced trauma, sometimes acute incidents but very often ongoing, complex trauma, with its helpings of dissociation and shame and confusion. To be clear: I *really am saying* that #alltraumamatters — I’m saying that because I don’t think our society can make the necessary breakthroughs on trauma-informed care until we acknowledge how incredibly pervasive the problem is. Hurt people hurt people. Transgenerational trauma has got to stop. Dear friends: I hear you saying “me too” and I am so sorry. Thank you for calling attention to your pain instead of hiding it. Thank you for offering your pain as an attempt to educate. Thank you for being vulnerable in public. I believe that by sharing our vulnerable hearts with each other we can start to build a better, more creative, more loving society. In kindergarten, no one else knew how to read, so I kept my mouth shut about it. My kindergarten teacher was gobsmacked when they assessed my reading skills at the end of the year and discovered that actually, I could read at a fifth-grade level, at least. (They ran out of readers to test me with, because my school only went to fifth grade.) 🙂 First grade was much happier for me, because I was free! Freeeeeee! And the librarians had been told about me, and they offered me ALL THE BOOKS. <3 I couldn't possibly love librarians more than I do. The following was originally posted on FB on September 15, 2014. When Mama and Daddy had a little bit of extra money, Daddy would “get cleaned up” and we would go to this seafood restaurant in Baton Rouge that he loved. I must have been about three or four years old when this happened: We were there, and a rich family, I mean RICH, was there, enjoying themselves a big seafood dinner. (I only understood these folks were rich later. I mean, we *all* like our fried shrimp in Louisiana, right?) They were so entranced with our family that they came over and started talking to us. I was sitting at the table *reading the menu out loud to Mama and Daddy* and talking about what I wanted. I had long black hair and looked like a china doll, I have been told. My mama, y’all will remember, was an exotic and beautiful Mexican woman, and my daddy was just as handsome as a movie star, in my mind, at least, in his 40s and all cleaned up. This gorgeous, though poor, couple had this exquisite bitty child reading out loud from the menu. The family made friends with us and kept in touch. They were well educated, well-to-do Catholics, and they sent me books and bought me pretty black patent leather shoes and when their daughter got married, they asked me to be her flower girl. So I walked down the aisle of a huge Catholic church in Baton Rouge, about six or seven years old, with black hair loose and wavy down past my bottom, and a beautiful dress they bought me. Mama and Daddy got dressed up so fancy like I had never seen them before, and we went to a party that filled my head with images of parties for the rest of my life. I DRANK CHAMPAGNE OUT OF A FLUTE, Y’ALL. Just a little sip for the flower girl, because *everyone* should have a toast to the bride and groom, cher. There are pictures. This really happened and I am not even making it up. Several friends have complained about the obituary. And its lede is obviously wrongheaded, I agree. Yet this is far from a “gratuitous gender profile of a female scientist” (as the Columbia Review of Journalism describes them). It would be absurd to write an obituary of this particular female scientist without describing her life as a woman; I would consider such an obituary a much greater failure than this one, its infelicities included. Erasing the specific circumstances Brill experienced over the course of her career would do nothing to help future scientists, but would instead gloss over the gendered realities of late 20th-century life. The article goes on to say that Finkbinder and Aschwanden “emphasized that [the Finkbinder test] should apply mainly to the sort of general-interest scientist profiles that one might find in The New York Times or the front section of Nature, which are supposed to focus on professional accomplishments.” That seems to apply to this obituary, which is obviously a general-interest scientist profile, and which is even in The New York Times. Aside from the aforementioned wrongheaded lede, however, this is an exemplary profile of a woman who was extraordinarily unusual for her cohort, and whose legacy comprises not just her rocket science accomplishments, but her notable efforts to promote the advancement of women in science. From the NYT obituary: “In her last week of life, she was still writing letters recommending eminent women in engineering for professional awards.” Dying of breast cancer, 88 years old, in her last week of life, she was writing these letters. I am deeply offended at the thought of an obituary of Brill that strictly follows the Finkbinder rules; she obviously felt passionately about her role as a scientist who was a woman. This 1100 word obituary does not stint on explaining Brill’s technical achievements. It also includes her observation that a “good husband is harder to find than a good job.” She does seem to have found an exceptional one; a fellow chemist, with whom she shared a 59 year marriage and three children; she also seems to have had a surprising lack of difficulty finding good jobs. Part of my objection to my friends’ objections about this obituary is that I want another 1100 words, all about her life as a woman. How did she do this? How did she only take off eight years, for three kids? What were her daily challenges with men who underestimated her? Yvonne Brill knew that being a role model for other women in science went beyond just showing up; what did she do to help, in addition to writing recommendations? As a reader who is a woman who was born over 45 years later, I’m still dealing with the same crap, and I’d love to know what she did. Christie Aschwanden’s rules will help keep lazy journalists from writing offensive, boring articles about their female scientist subjects. We’ve all read those pieces; I’d be very glad to see them go. The lede for this obituary should have said, simply, “Yvonne Brill, a rocket scientist who invented a propulsion system in the 1970s to help keep communications satellites from slipping out of their orbits, died on Wednesday at 88 in Princeton, N.J.” As it stands, this obituary, bad opening and all, situates Yvonne Brill in her context, the second half of the 20th century into the 21st, where women still cope with intense discouragement from participating fully in society. In the end, I’m weirdly happy the Times made a mess of it. I would never have read this obituary if it hadn’t been pointed out to me by my sharp-eyed friends. * Note: The original lede was, “She made a mean beef stroganoff, followed her husband from job to job and took eight years off from work to raise three children. “The world’s best mom,” her son Matthew said.” After complaints from readers, and the attention of the Public Editor, the lede currently reads, “She was a brilliant rocket scientist who followed her husband from job to job and took eight years off from work to raise three children. “The world’s best mom,” her son Matthew said.” Both are bad. Today I was delighted to learn about a wonderfully creative yarn shop in Portland, Yarnia. Custom blended yarn is the norm there; all of the yarn offered is created (on a custom-made yarn winding machine) out of up to six singles yarns (although the singles yarns are also available for purchase). Your choices include a wide array of colors, as well as fibers ranging from inexpensive acrylics to cashmere to tweedy mohairs. After you decide on your desired amount of yarn (by yardage or by weight) the staff will wind it up to your specifications. They even keep notes on your choices, so that if you want or need more of your custom yarn, they’ll be able to recreate it for you. Suetado’s fiber content of wool, bamboo, and nylon, in muted neutrals, reminds me of the yarns used in knit garments at Eileen Fisher (at a fraction of the cost). At $22 for 435 yards, it’s an amazing bargain. 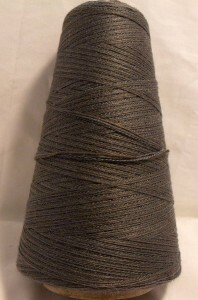 Handspinners have always had the option to combine strands for more complex yarns. And of course handknitters can do it by setting up multiple cones of singles, but coned yarn is often only sold in immense quantities, and knitting from multiple cones is awkward. The service Yarnia provides, blending and packaging exactly what you request, is an example of mass customization akin to Timberland’s Design Your Own boots or various custom denim companies. Using a blend from Yarnia, every aspect of a knitting project can be knitter’s choice — fiber content, number of strands, colors, textures, pattern used, sizing — so you can be sure your handknit will be unique. I look forward to making a pilgrimage to Yarnia someday (or at least ordering from their clever online custom yarn builder).